Hello and welcome. They call me Vanderkin in these parts and I would be pleased to have you walk with me for a bit. I wander to and from all places and much has come to my attention that should be shared. I can tell you of a story that has come to my attention recently. I warn you. Investigation into THIS matter could make your life somewhat short. I share this with you for it is of great concern to some. The tale comes from a traveler recently out of the great city of Balic. It took some work to put together all the pieces. Pay close attention. The watcher looks over the city with keen interest. The streets look the same and the people that walk them cross borders they can't see. Behind the scenes three powers struggle to control each stone. The watcher smiles thinking about his agents pushing here and there. 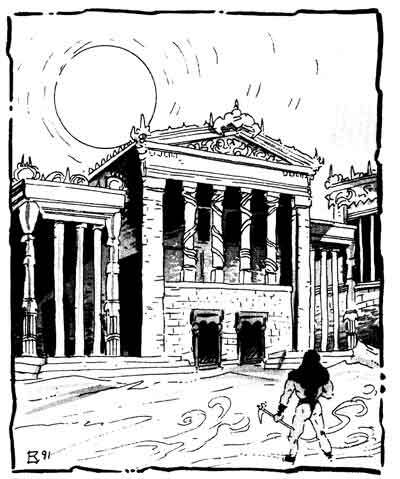 "I suppose there are 4 powers flexing their muscle in the city of Balic". He speaks to no one. His attention turns from the streets to the mind of one of the templars. Of those that once served Andropinis the strong still attempt to hold power. It is one of these the watcher has bent his will upon of late. Brazus, once chief of markets, finds himself now as Tomblador's lackey. It is time he showed a little grumba. "You there! I ask again that you bring me the documents regarding Rees' latest absurdity. "The audacity of those fools to think that Balicans will be happy to pay off savages for want of a little peace makes my gorge rise. With my help house Rees will be no more. When the rubble that was house Rees is cleared away theirs will be ours. "Mine." Since Wavir's hold on its own is so precarious there will be no challenge. "As you wish Lord Brazus. I will find all details and bring them to you at once". The fool had better fetch them himself. If he thinks a messenger will do when I explicitly said that I wanted HIM to bring me the parchments he may lose my favor. I may let it slide, however. I find this villa and his wife quite comfortable for me. I wouldn't want to risk this one to suffer the same fate as several of his equals. Once alone in the master chambers of this house Brazus bolted the door. That one will wait all night before knocking on THIS door. Removing the wrapped parcel from its concealed location Brazus removed the artifact. 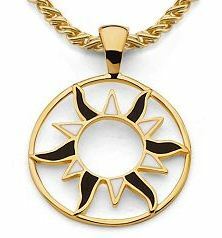 A simple gold medallion emblazoned with the burning sun, when hung around his neck a sense of nostalgia seeped through him. He squashed it deep into his subconscious and concentrated on the image of the sun on the disk. A medallion such as this was once Brazus' connection to King Andropinis and now connects him to an agent from another merchant house. A house bent on the destruction of Wavir or so it would seem. Sometime after Androponis' disappearance all templar medallions grew white hot. Some were scorched, others broke into pieces. Brazus' own cracked into two clean halves. Some obviously were spared. The one now around the high templar's neck was delivered by a secret courier. Inquiries turned up no information as to its origins. Nor could he find out if there are other templars in the city with a similar gift. Andropinis never encouraged psionic talents from his templars. With so little training it took intense concentration to proceed with these meetings. Emptying his mind of all but the image of the gold disk Brazus sank into the mindscape. Having little knowledge of the mindscape he isn't sure what to make of the oppressive blackness or the piercing yellow eyes. All messages from the stranger come immersed in this featureless black landscape. Piercing eyes amid a black field is the symbol of house Tsalaxa, one of the biggest trading houses in the region. It is no coincidence that a house member would choose to communicate with someone so close to their biggest foes Wavir. Unfortunately the informant chooses not to converse in words. Today a black and white map of Balic floats to the surface. There are boundaries on this map; ones not seen from the streets. Clearly there are three compounds. The white palace that is Wavir's base, House Rees can be seen over-strong in their superiority and house Tomblador. As Brazus watches there is a sudden flash from deep in the Rees district. It appears to burn itself up and consume the entire Rees compound. The map gets blurry but when it comes back into focus a few moments later the buildings of the district remain. It was the boundary that burned away. There is no sign of house Rees anywhere. What burned up first looked to be a warehouse, one of the smaller ones just west of crafter's market. The image fades, the eyes continue to watch. After what seems an eternity the eyes close. Brazus finds himself back in his chambers. As is usual with these encounters it is hard to recall how long it took. It could have been 5 minutes or 5 hours. After securing the medallion in its safe place Brazus decides on instant action. To the market, I'm sure I can find something of interest in crafter's market. Throwing open the door he marches straight past the former noble clutching the scrolls he was sent to fetch. Had Brazus looked back he would have seen the noble enter his former quarters and heard him bolt the door. That is my tale. Now don't be too upset that I left it unfinished. It is the incomplete that keeps us striving for knowledge. It is up to the listener to come up with fanciful adventures based on these potentially momentous events. Don't you agree? Vanderkin will walk with you again soon. This scenario stemmed from a planned adventure in Balic I started working on. Dealing with the intrigue between the three houses the PCs would begin unraveling plot threads thick with double-dealing and hidden agendas. For motivations I suggest reading carefully the entry of Balic in the Wanderer's Chronicle and from Dune Trader the Wavir and Tsalaxa information. This was only one small piece of the puzzle. I hope you liked it. He could be several people. Brazus could be right. Ever since Wavir seized the White Palace of Balic Tsalaxa has had significant difficulty in markets they used to do very well with. It is feasible that they're looking to help one side or the other get stronger. This is classic Tsalaxa behavior. They're not strong enough to challenge Wavir directly but by pulling strings in other camps their long-term goals can be met. There could be a more reasonable answer. All trading houses have enemies. There could be any number of groups out to see Rees or Wavir fail. A Medallion with some unusual enchantments would be just the thing to lure a templar into some secret service. There are rumors that some of Andropinis' templars have been in contact with their vanished-king. This could be true. The yellow eyes in the sea of blackness could be Andropinis looking out from his prison in the black. This is how this will work out in my campaign. Aside from Kalak I have not killed off any sorcerer kings. Watch these pages to learn how I pulled that off while remaining true to the Prism Pentad. Brazus' medallion is a psionic item that allows communication by two individuals that may not know each other. The item is empowered with Mindlink for communication purposes and Psionic vampirism to provide the medallion with the PSPs needed for the job. The item's main purpose is for the creator of the item to put it into the hands one someone else and allow two individuals psionic communication. People that do not know each other, individuals that may not trust each other, or those may not have access to telepathic powers can all benefit greatly from the item. The creator of the item is the only one who can designate persons able to use it. In this way there can be great control who can use the piece. Since this mindlink takes place inside the empowered item there is not the usual danger of contacting hostile minds. PSPs required to maintain the mindlink could come from the use of psionic vampirism and the item's own PSP pool. As a psionic item with very little ego it rarely is able to do anything against its creator's wishes. NOTE: Please take note that for this item to be of significant use there must be in place some rules modifications to allow telepathic powers to work beyond line of sight. As a templar without a Sorcerer King Brazus has no spell abilities. Magic: Aside from the medallion Brazus has a rare enchanted Widow's Knife. The unique weapon was a gift from his time working for Andropinis. Brazus works for the merchant house Tomblador of Balic. Tomblador finds itself matched evenly with house Rees of Balic and both houses are in the shadow of giant Wavir. When Andropinis was king Brazus' title was chief of markets. The job consisted primarily of taking care of bribe (tax) money from the merchants doing big business in the city. Now working for Tomblador the job is similar but somewhat less rewarding. Brazus' aims are to regain as much power as he had as a high templar. He seems to have a personal grudge against house Rees. A grudge that Tomblador would not approve of. The vendetta is not a good business tactic for a major merchant house. As high templar it was his way of life and not soon forgotten.